EghtesadOnline: So much for a quiet Friday in late August. After weeks of relative slumber, gold traders were rudely awoken to a surge in volume and volatility. In a span of one minute, gold futures contracts equaling more than 2 million ounces traded -- about 20 minutes before Federal Reserve Chair Janet Yellen was to address a gathering of policy makers in Jackson Hole, Wyoming. According to Bloomberg, the episode jolted the market after a measure of 60-day volatility on the metal touched the lowest since 2005. Gold had been in quiet mode even amid political discord in Washington, concerns about rising U.S. interest rates and tensions between the U.S. and North Korea. Yellen’s speech, which lacked clear rate cues, did little to calm the price swings and damped expectations of a rate hike this year. 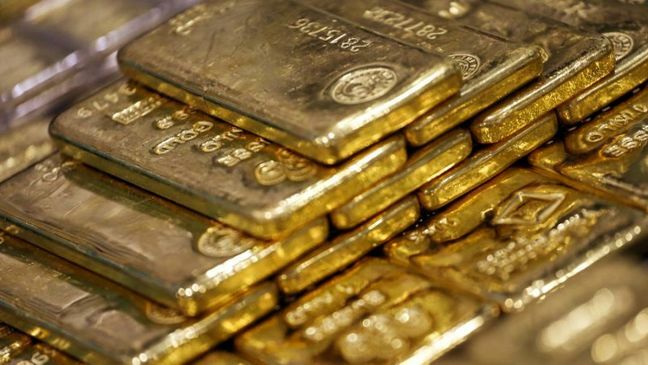 Gold futures for December delivery rose 0.5 percent to settle at $1,297.90 an ounce at 1:36 p.m. on the Comex in New York, after falling as much as 0.8 percent and climbing 0.7 percent to briefly pierce the $1,300 threshold. After peaking at 21,256 gold futures contracts at 9:41 a.m., trading fell to 6,683 contracts a minute later. 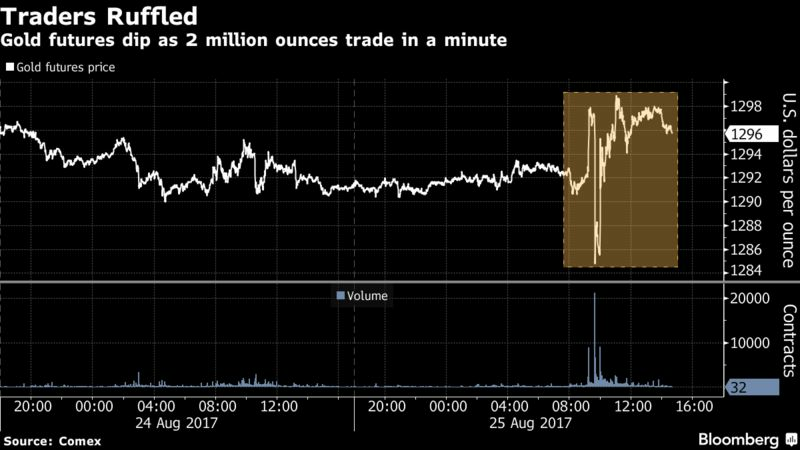 On June 26, the market was also rattled when 18,149 lots equaling about 1.8 million ounces of gold traded in just one minute. It later fell back to 2,334 lots. Federal Reserve Bank of Dallas President Robert Kaplan may have helped fuel the sharp move before Yellen’s speech Friday by saying the central bank can afford to be patient on raising interest rates even while noting it should shrink the balance sheet soon. Base metals also fluctuated Friday. Copper on the Comex settled unchanged at $3.0565 a pound at 1:27 p.m. in New York, after falling as much as 0.5 percent and rising 0.7 percent. The metal posted a seventh weekly climb, the longest stretch of such gains since 2009. On the London Metal Exchange, copper slipped 0.3 percent after advancing as much as 0.9 percent. The five other main metals also fell.